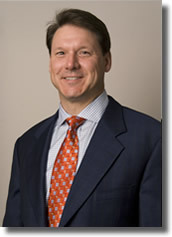 Dr. David Diduch has practiced Orthopaedic Surgery at the University of Virginia since 1995. His practice focuses on sports medicine, including knee and shoulder reconstruction. This includes arthroscopy, ACL reconstructions, meniscus and cartilage surgery, rotator cuff tears and shoulder instability, as well as the various lumps and bumps from sports. He cares for athletes of all ages, from adolescents through older persons who exercise for fitness. A large part of his time is spent caring for the athletes at the University of Virginia where he serves as the Head Orthopaedic Team Physician. As part of Dr. Diduch’s practice in an academic institution, he is always teaching. Orthopaedic surgery residents, sports medicine fellows, and medical students shadow him in the office and assist in surgery. Dr. Diduch also serves as the Fellowship Director for Sports Medicine. An academic career also involves research, and numerous clinical trials are always available for interested persons through his office. “I am married to Lynn and have 3 sons, two of whom are students at UVA with a third in high school. I love to play golf with my boys but they beat me every time. We also enjoy skiing and fly fishing in Montana. We are members of Trinity Presbyterian Church. Subspecialty Certificate in Sports Medicine, American Board of Orthopaedic Surgery through 2018, Virginia.